On-budget solutions that add space and value to your home. There are several different people you could enlist to design your home extension. An architect tends to draw up plans that provide the most in-depth and creative route for you to achieve something unique. However, this often comes with a hefty price tag and you won’t know the cost of the build until you get the designs priced up, which can take months. A builder may be able to design your extension but it is likely this will occur alongside the construction process and given time pressures, may lack the advanced planning and detailed considerations of an architect. It is by far the cheapest option but who knows what you’ll end up with: if it’s an individual builder, there may be no one holding them to account, which is a risk if it turns out not to be on budget and with the quality and design sadly amiss. Despite its affordability, it might be a gamble with your savings. There’s then a design and build route, which we offer at MOSS, alongside our pods. Have you read our previous blog ‘Design and Build vs Traditional Builders’ where we describe this process. Finally, there is the pre-designed pre-fab route where you can buy tried and tested construction and design: there are endless benefits. There aren’t that many companies out there yet that offer something luxurious, high quality and with the flexibility that you would want when adding a modern extension with the wow factor to your home. But at MOSS, we offer just that, combining the reliability of an architect’s design with affordability, because the fundamentals of the product have already been designed. Why not hop over to our website gallery to check out some gorgeous MOSSpod extensions? All our projects are built on time, within budget and have resulted in very happy customers! Always consider when you would like your home extension completed by and the best time for you and your family to host a construction team. Don’t forget that designing something from scratch will require a lot longer than something pre-designed. The construction process is likely to be much lengthier too: a traditional masonry-constructed extension would take a minimum of 3 months on site as opposed to 3 weeks for a pre-designed timber construction. It just depends on the time you have and what works best for you. None of us want to be given an initial quote, only to find that later down the line it will actually cost twice as much… and you have no choice but to carry on. It’s unfortunate that some builders work in this way because if no contracts are signed, there are no restrictions on them. Make sure you ALWAYS request a contract (especially when it comes to finances) and don’t be afraid to ask for amendments! Of course, it is extremely difficult for builders to come to a definitive cost before starting if they are carrying out designs that they have never done before and working without the services of a quantity surveyor; but this doesn’t mean you should pay the consequences. This is why choosing a pre-designed and pre-priced unit that has been built many times before will mean that your extension has a far higher chance of sticking to budget and timescale. At MOSS, we even go further and give you a fixed quote before you place your order, so you can plan thoroughly from the start. Have you considered that you might not even need planning permission for your extension? Back in April we wrote a blog that takes you through the whys and the wherefores of needing planning permission (and more often than you think, you won’t need it!). If you’re unsure, just give us a call and we can look into it with a few quick checks. 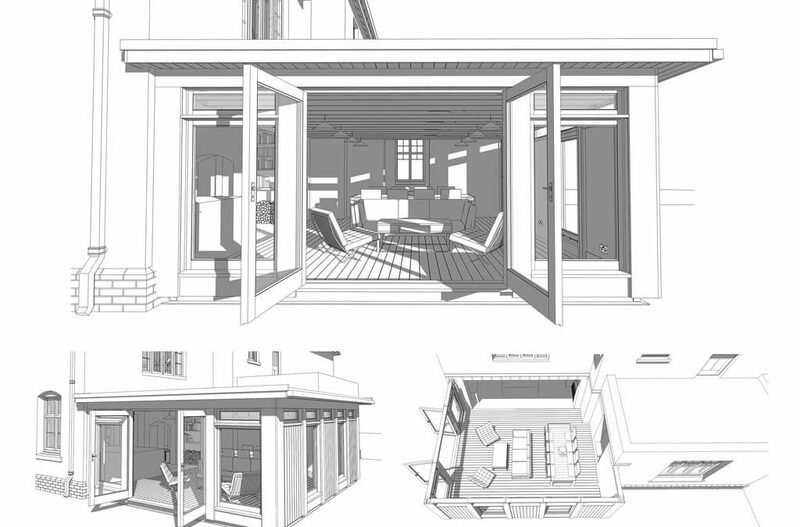 If you do need planning permission, we can produce and manage an application on your behalf. None of our pods have been refused so far and we don’t intend on breaking our winning streak! So, if you’re thinking about adding a luxury extension to your home, which stays on budget while adding some bonus value to your property, why not have a chat to us in a free design consultation and we’ll set you on the path to achieving your goal. Your home extension could be with you sooner than you think!